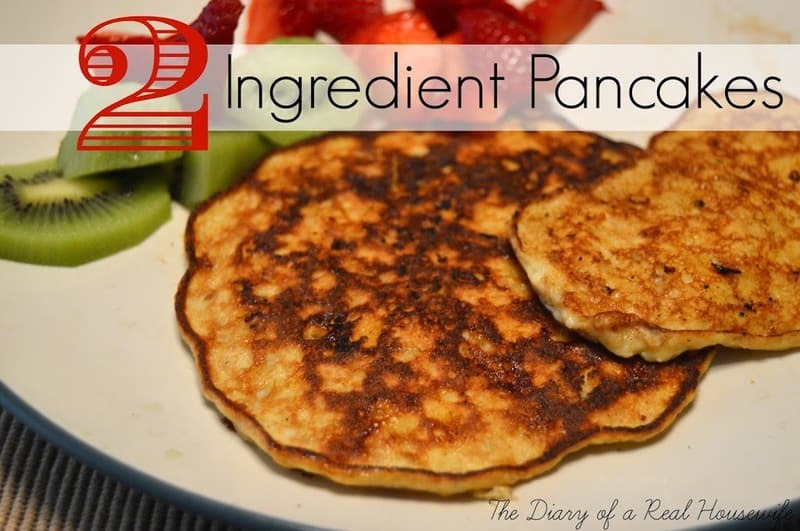 I served these 2 ingredient pancakes to my family for breakfast, and didn’t warn them of any difference before they dug right in! I didn’t hear one complaint either! These are the best fake pancakes I have ever had. These are gluten free, grain free, dairy free and have no added sugar! That’s my kind of breakfast! 1. Peel banana and place in a large bowl. Smash banana, add egg, and mix together. I used a fork to mix and it helped break up the banana really well. 2. Heat a skillet on the stove top on medium heat and spray with cooking oil. 3. Place 4-5tbsp of mix for each pancake. 5. Serve warm. I drizzled mine with little syrup and served with a side of fresh fruit. So easy and so much better for you! OKAY, I have GOT to try this! Oh wow, these look amazing!! I’m home alone one night this week for dinner, so I think I know what I’ll be making: breakfast for dinner! This seems like a great way for me to use up those bananas that are getting too ripe. So simple too! I thought for sure this recipe was going to be another cake box mix plus one other ingredient recipe, but I’m glad I actually checked, these look awesome!